WBA welterweight champion Sen. Manny Pacquiao laughed off the injury in his left eye, saying he endured the same minor corneal scratch in his other eye in a previous fight and assured fans there’s nothing to worry about in a brief stage appearance following a Christian Sunday service at the Michael Jackson Theater in the Mandalay Bay Resort and Casino the day after outpointing Adrien Broner to retain his crown in Las Vegas. Sugar Ray Leonard was 26 when he underwent surgery for a detached retina in 1982 and made a comeback to the ring after two years. The comeback extended to seven fights until his final retirement in 1997. 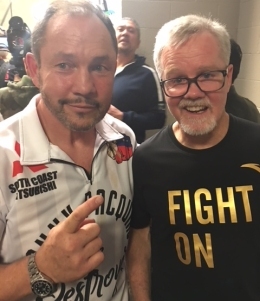 The comeback included fights against Marvin Hagler, Roberto Duran, Tommy Hearns and Donny Lalonde whom he stopped to win the WBC lightheavyweight and vacant WBC supermiddleweight titles. Another fighter who returned to action from surgery to repair a detached retina was former WBO heavyweight champion Lamon Brewster. He suffered the injury at 33 during a fight against Belarus’ Siarhei Liakhovich in 2006 and came back after a year and three months to face Wladimir Klitschko. Brewster fought five bouts after his surgery, winning twice, until his retirement in 2010. Ophthalmologist Dr. Arnold Salud said there are many degrees of retinal detachment and “recovery before one can fight again (if pwede pa) can range from one to six months.” Dr. Salud, whose late father Rudy was a former WBC secretary-general, said it’s “good if corneal abrasion only.” He said “corneal abrasion heals in two to three days when the eye is patched tight.” So it’s why Pacquiao’s left eye was patched at the Christian service the day after the fight. Meanwhile, VADA (Voluntary Anti-Doping Association) president Dr. Margaret Goodman reached out to clarify a report that Fortune couldn’t get an advice whether or not to treat Pacquiao’s cold with Benadryl before the Broner fight. “VADA has always been available to us 24/7,” said Fortune. “Yes, I did contact Dr. Goodman. Always better safe than sorry.” Fortune said he never got to ask about Benadryl as Pacquiao decided not to take any medication for fear of consuming a banned substance without his knowledge. Fortune said he has never had difficulty contacting VADA and getting clarification on any drug issue because it’s accessible at all hours, every day.